1 of 5 In food processor, combine crabmeat, sweet pepper, scallions and carrots. Pulse until all ingredients are finely chopped and well combined. Add eggs, mayonnaise, salt, pepper and tarragon. Pulse until blended and all the ingredients are evenly moistened. Transfer mixture to medium-size bowl. 2 of 5 Heat oven to 350 degrees F.
3 of 5 Stir 3/4 cup bread crumbs into crab mixture; place remaining crumbs in shallow dish. 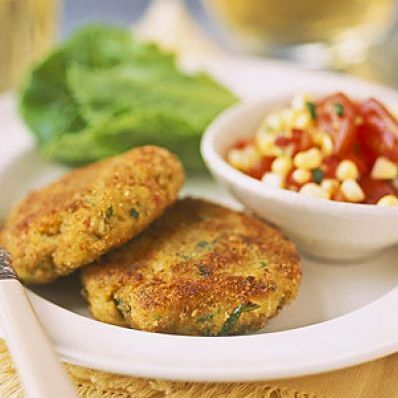 Shape crab mixture into 2-1/2-inch patties or cakes, using scant 1/3 cup mixture for each (you should have 12 patties). Coat cakes with remaining crumbs. 4 of 5 In a large skillet, heat 2 tablespoons oil over medium-high heat. Place 6 cakes in the skillet; pan-fry for 2 minutes or until lightly browned. Turn cakes over; pan-fry for 2 minutes or until lightly browned. Transfer cakes to large baking sheet. Heat remaining 2 tablespoons oil in skillet. Fry remaining cakes as above. Transfer to baking sheet. 5 of 5 Bake crab cakes in 350 degrees F oven for 5 minutes or until instant-read thermometer inserted in centers of cakes registers 160 degrees F.
1 of 1 Meanwhile, in a small bowl, stir together the corn kernels, onion, sweet pepper, cherry tomatoes, lime juice, salt and black pepper until well blended. Season with hot-pepper sauce. Serve the relish with the crab cakes.